The mint julep is a centuries-old bourbon-based cocktail that is often associated with the American South and the Kentucky Derby in particular. It was originally prescribed to cure sickness of the stomach as early as 1784. The Kentucky Derby Museum claims the cocktail the signature drink of Churchill Downs in 1938, with the modern two-day annual event serving over 80,000 of them. 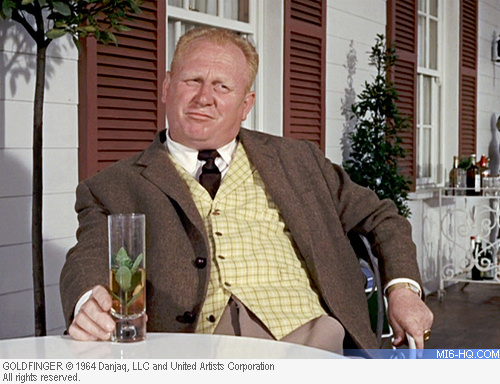 It is no coincidence then, that Auric Goldfinger serves mint juleps as his cocktail of choice whilst relaxing on his stud farm in Kentucky. 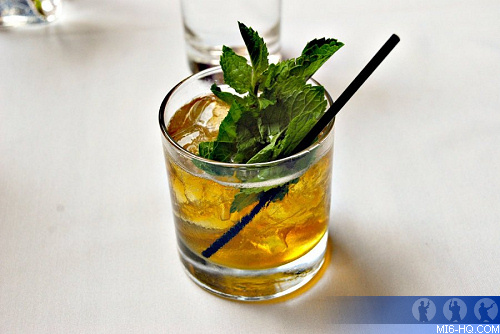 A mint julep is traditionally made with four ingredients: mint leaf, bourbon, sugar, and water. Spearmint is the mint of choice used in Southern states, and in Kentucky in particular. The fresh mint and other ingredients are muddled or crushed in preparation for flavoring the finished drink, further releasing essential oils and juices into the mixture, intensifying the flavor. 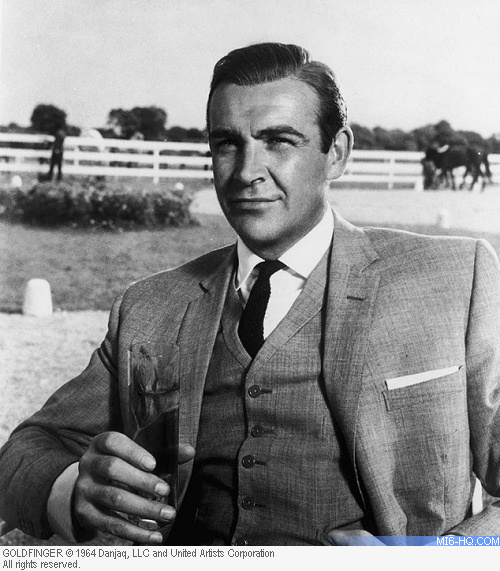 GOLDFINGER: Ah, Mister Bond. Sit down, please. A mint julep? Traditional, but satisfying. BOND: Yes, thanks. Sour mash, but not too sweet, please. Mint juleps were often served in silver or pewter cups originally, and held only by the bottom and top edges of the cup. This allows frost to form on the outside of the cup. Today, mint juleps are most commonly served in a tall old-fashioned glass, Collins glass, or highball glass with a straw. Above: A prepared Mint Julep cocktail. Ingredients: 2oz Bourbon whiskey, 4 mint leaves, 1 teaspoon powdered sugar, 2 teaspoons water. Method: In a highball glass gently muddle the mint, sugar and water. Fill the glass with cracked ice, add Bourbon and stir well until the glass is well frosted. Garnish with a mint sprig.